Cardiff Blues welcome Glasgow Warriors to the Arms Park on Friday night in the game of the Pro12 round. After two impressive wins to start the season this will be a real indicator of where the team are this year under Danny Wilson and his coaching staff. Following on from last week’s excellent win away at Munster, all the comments in the media from inside the Cardiff camp have been tinged with cautious optimism, but keen to point out they are under no illusions how tough Friday’s game will be. Wilson has described Glasgow as the ‘form team in the Pro12’, calling it ‘our toughest game yet’. It’s hard to disagree with that assessment on the basis that the Scots have beaten champions Connacht 5-41 in Galway and Irish powers Leinster 33-25 at Scotstoun. Coming off the back of being beaten in last year’s Pro12 semi-final they are hunting for the trophy, and as the top scorers last year, the only team above Cardiff in that respect, they are well equipped to do it. Between the two sides there has been 132 points scored so far this season, meaning all the hopes are for a high scoring game on Friday night. With the club putting on a ‘kids for a quid’ event and showing an increased social media presence, alongside some help from Media Wales, there’s scope for a very big crowd and I’d urge people in the area to turn out even if they don’t support either time for what should be an exhibition of rugby union. Of course Cardiff Blues fans should particularly be coming out in force to support the boys who really deserve to have a bumper crowd behind them on Friday. They have played some outstanding stuff in the opening two games and if that’s not enough to get the fair weather fans out of the woodwork then I don’t know what is. I understand Friday night kick-offs are not particularly friendly for most, but I hope we’ll be looking at around 7/8k in attendance. The crowd size should then reflect the brand of rugby being played, but also the mental resilience installed by Wilson. Going behind with 20 minutes to go in Munster would’ve spelled the end for us a few years ago, and you can forget about holding a single point lead for almost 10 minutes, but we got the win. That psychological strength will be put to the test again on Friday though as the players need to overcome 10 straight Pro12 losses against Glasgow. There has been back-to-back wins in a Heineken Cup double header in that time, and we did gleam two losing bonus points from last year’s league fixtures, but this Glasgow team is as strong as they’ve ever been. 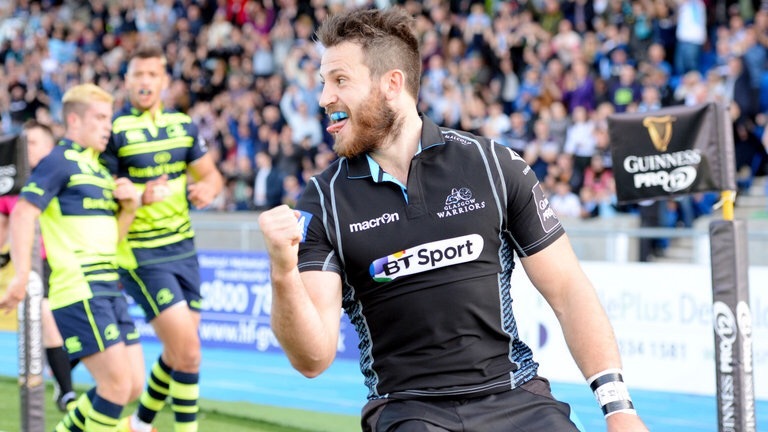 Left winger Tommy Seymour is in unbelievable form with six tries in two games, while the team have made 30 line breaks, produced 27 offloads and beaten 56 defenders. Seymour will actually line up on the right wing when visiting the Arms Park on Friday night to facilitate one of the six changes to the Glasgow side from that which beat Leinster. Lee Jones comes in for Leonardo Sarto as his wing partner, while there’s new partnerships at centre, where Nick Grigg makes his full debut outside Peter Horne who played at 10 last week. Rory Clegg is the fly-half with Ali Price at 9. In the forwards Scottish international tighthead Zander Fagerson is picked ahead of Sila Puafisi, and his national side team-mate Josh Strauss returns at number eight, Ryan Wilson switching to blindside flanker to facilitate his return. On the bench there is a first involvement for centre Mark Bennett after his Team GB 7s exploits in Rio. Cardiff welcome back a number of their own internationals with Josh Turnbull (lock), Sam Warburton (openside) and Lloyd Williams (scrum-half) return to the starting line-up, alongside Matthew Morgan making his first competitive start in a Cardiff Blues shirt. Josh Navidi is a positional change to allow for Warburton’s re-introducing, going back to number eight as the three number 7 line-up in the back row returns. Macauley Cook, Nick Williams and Tomos Williams are all named on the bench, while Dan Fish is the only new injury news after that ankle injury that saw him hobble around for the last five minutes in Munster rules him out for a week. Blaine Scully is among the replacements to cover the back three, taking the total number of internationals in the squad to 18. not bad at all! The toughest test in Pro12 rugby awaits on Friday night, but for once I don’t have a feeling of complete dread going into a game with the best team in the league. We are more than capable of matching them up front, and if our defence can have the game of it’s life, or alternatively we can outscore Glasgow, then the season is ours for the taking. I haven’t been so excited to get to CAP in a long time, come on Cardiff!! George Clancy (IRFU) – After a whole season without seeing him, Clancy returns to the Arms Park for the first time since December 2014 with a vengeance. He seems to like this fixture with his last three Cardiff games being when we’ve taken on Glasgow. Home and away losses in the league were preceded by a Heineken Cup win. Here’s hoping he doesn’t ruin the game!